Open - 1 Michael Steadman $750, 2 Bob Smith $500, 3 Gino Thornton (taking 1st U2000 prize), 4 Anthony Ker $400, 5 Nic Croad $300, 6 Daniel Han $200. Under 2000 - 1 Gino Thornton $400, 2 Bruce Wheeler $300, 3 Richard Taylor $200, 4 Mario Krstev (taking 2nd Junior prize), 5 Daniel Shen (taking 1st Junior prize), 6 Ross Jackson $100. 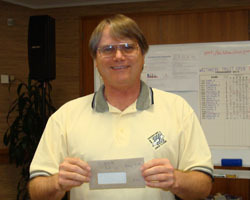 Under 1700 - 1 Neil Cruden $350, 2 Jim Cater $250, 3 Devon Smith $150, 4 Ron Collingwood (taking 2nd Senior prize), 5 Richard Dare $75. Under 1400 - 1 Gary Judkins $300, 2 Thomas Gothorp $200, 3 Alan Ansell (taking 2nd U14 & U1400 prize), 4 Hans Gao (taking 1st U14 & U1400 prize), 5 Ron Collingwood (taking 2nd Senior prize), 6= Vaughan Collingwood, Karl Zhu $75 each. Junior - 1 Daniel Shen $300, 2 Mario Krstev $200, 3 Andy Chen $100, 4 Alan Ansell (taking 2nd U14 & U1400 prize), 5 Devon Smith (taking 3rd U1700 prize), 6 Sue Maroroa $50. 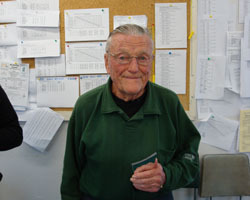 Senior - 1 Peter Stuart $300, 2 Neil Cruden (taking 1st U1700 prize), 3 Jim Cater (taking 2nd U1700 prize), 4 Ron Collingwood $200, 5 Viv Smith (taking 2nd Female prize), 6 Bob Mitchell $100, 7 Wayne Power $50. 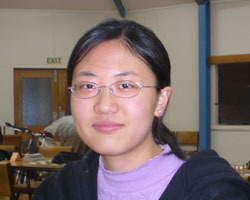 Female - 1 Helen Milligan $300, 2 Viv Smith $200, 3 Katy Qiu $100, 4 Nicole Tsoi $50. Under 14 & Under 1400 - 1 Hans Gao $150, 2 Alan Ansell $100, 3 Karl Zhu (taking 3rd= U1400 prize), 4 Alex Pan $50. Download the Final report of the season (Word document). 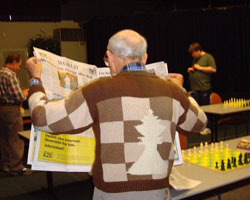 December 17th 2008 - North Shore Chess Club Prize-Giving, North Shore. 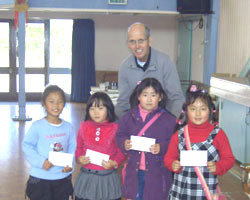 The annual North Shore prize-giving ceremony was held at the club. 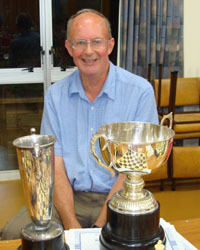 The main awards were the Lightning Championship (Tony Carpinter), the Rapid Championship (Paul Garbett), and the Club Championship (Paul Garbett). December 14th 2008 - ACA Teams Lightning, Auckland. 5th Howick-Pakuranga (Pan A, Zhang W, Chen Alan, Ferguson). December 6th-14th 2008 - Australian Masters, Box Hill, AUSTRALIA. December 6th 2008 - MIT Open, Auckland. 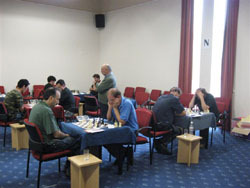 September-December 2008 - Palmerston North Club Championship, Palmerston North. 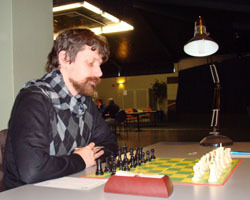 November 12th-25th 2008 - 38th World Chess Olympiad, Dresden, GERMANY. Full results can be found at chess-results.info/tnr16314.aspx?lan=1 and many stories at The Closet Grandmaster. The NZ Open team finished in 97th place (out of 147 teams) on 10 match points. 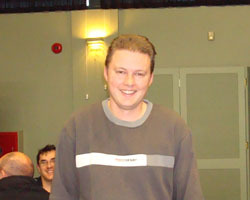 After a fantastic start Roger Nokes was on course for much of the event for an IM (International Master) norm. However, the team faced strong opposition in the final four rounds after the upset win over Bosnia and Herzegovina in round seven. 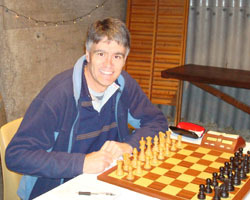 Bob Smith lost by default in round 4 due to his failure to arrive at the board by the appropriate time. The NZ Women's team finished in 62nd place (out of 111) with 11 match points (ahead of Australia on 10). 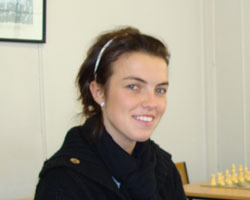 Congratulations to Vivian Smith, whose result qualified her for the wfm (Women's FIDE Master) title. 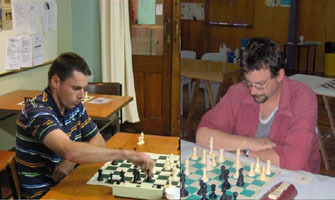 November 15th 2008 - Wellington Rapid, Wellington Chess Club. 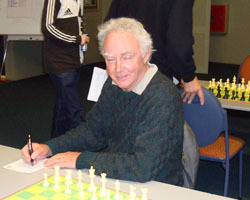 October 24th-27th 2008 - Merv Morrison Memorial Chess Tournament, Auckland. October 26th 2008 - Hawkes Bay Blitz Championship. October 25th 2008 - Hawkes Bay Championship. 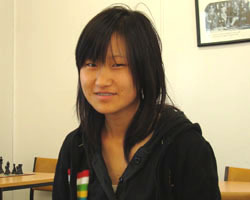 October 19th-31st 2008 - World Youth Chess Championships, Vung Tau, VIETNAM. NZL representatives and scores (updated daily) below. 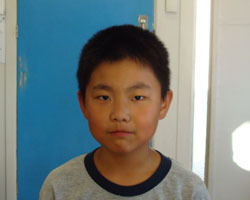 Note also Jack Ruan (Open u-12) and Harry Ruan (Open u-10), now representing Australia. 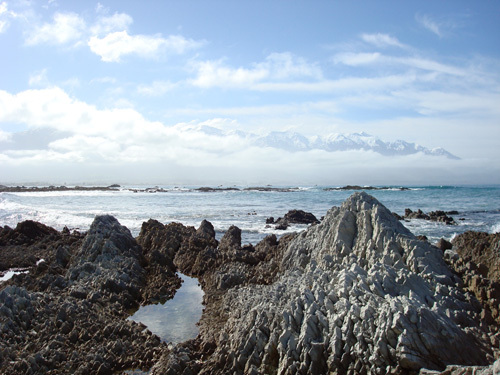 October 8th-12th 2008 - South Island Championship, Kaikoura. Sponsored by Sunrise Bungalows in Kaikoura, Kaikoura Winery, and Benson Insurance Brokers Ltd. 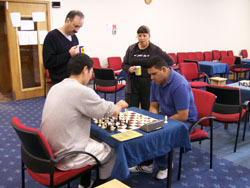 Note: the tiebreak for the top three places was carried out on the basis of the mini three-player all-play-all within the event. Johansen beat Solomon and drew with Chandler; Chandler drew with both Johansen and Solomon; Solomon lost to Johansen and drew with Chandler. The crosstable below is in the normal tiebreak (Bucholz) order generated by SwissPerfect. Thanks to arbiter Craig Hall for officiating. Some photos below. See also Justin Davis' amazing portfolio at www.nzchessevents.myphotoalbum.com. Games now available. Download the pgn file here. 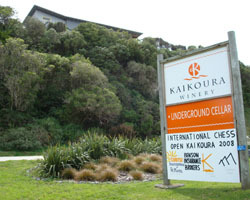 Kaikoura Winery is at the top of a limestone cliff just off State Highway 1. 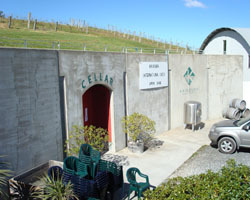 The entrance to the playing hall - the wine cellar. 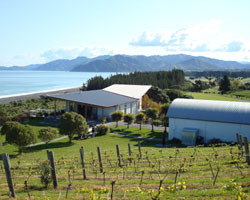 A view of the Winery from above. The cellar is under the slope beyond the right edge of the photo. Inside the cellar. 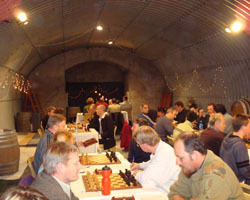 The players are surrounded by wine barrels. The men who made it happen - Chris Benson and Kevin Tetley. 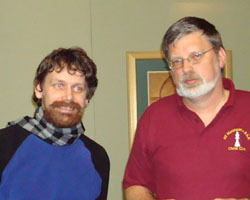 Murray Chandler and Darryl Johansen. 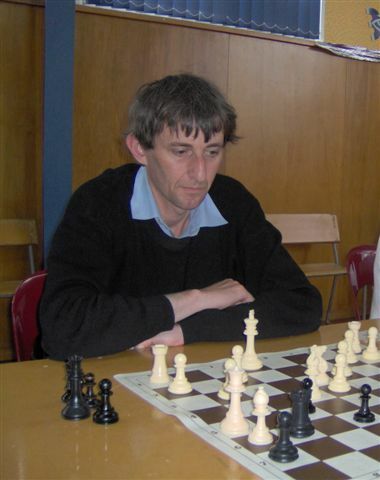 South Island Champion and Olympiad player, Roger Nokes. Seascape with mountains - a stunning location. 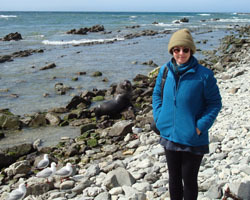 Your webmistress with a seal (on the left). September 27th-October 5th 2008 - George Trundle NZ Masters Tournament, Auckland. 1st equal: Johansen, Solomon 6/9; 3rd Toth 5½; 4th and trophy for highest-placed New Zealander: Nic Croad 5; 5th= Smith, Steadman 4½; 7th Baider 4; 8th Watson 3½; 9th= Lukey, Reilly 3. 1st Thornton 7/9; 2nd Shen 6; 3rd Bennett 5; 4th= Chen, Wheeler 4½; 6th= Goodhue, Latimer, Milligan, Stuart 4; 10th Fuatai 2. 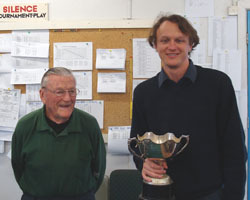 Winners Darryl Johansen and Stephen Solomon, with George Trundle (centre). Top New Zealander, Nic Croad. 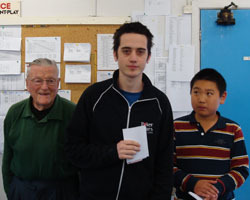 Winner of the Qualifier event, Gino Thornton (centre), and second-placed Daniel Shen. Promising kiwi junior Daniel Baider. 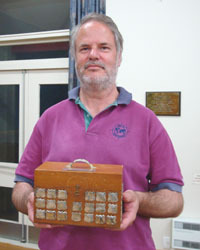 Sponsor and enthusiast George Trundle, with his Life Membership award. September 27th-28th 2008 - National Interschool Finals, Hastings. 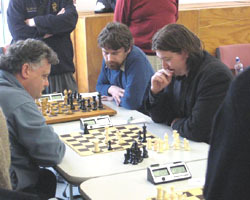 September 21st 2008 - Jim McIntosh Shoemaker Rapid Tournament, Kapiti Chess Club, Paraparaumu. 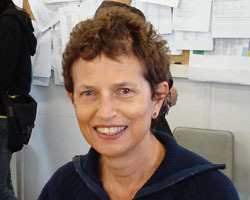 against Zita Rajcsanyi. David Wu against Martin Sims. Stewart Holdaway vs Zita Rajcsanyi. with IM Anthony Ker watching intently. Lots more pictures can be found at nzchessevents.myphotoalbum.com. Thanks to Guy Burns and Justin Davis for results and photos. September 14th 2008 - Second Sunday Puchen GM Rapid, Auckland. 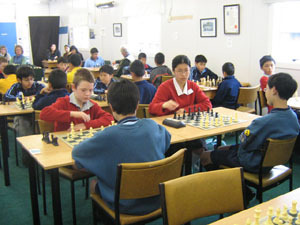 September 5th 2008 - Auckland Intermediate and Primary Schools Championships. A view of the event. 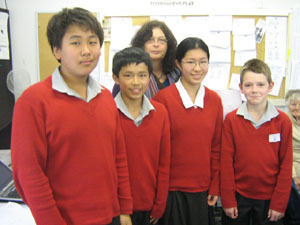 Rangeview: Harry Cui, Edison Yang, Mona Yang and Zachary May with teacher Virginia Dunn. August 30th-31st 2008 - North Shore Open. 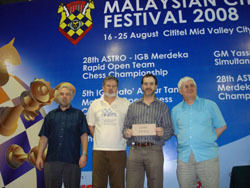 August 15th-24th 2008 - Malaysian Chess Festival, Kuala Lumpur, Malaysia. Several Kiwis travelled to this event. In the 11-round 5th Dato' Arthur Tan Malaysia Open Championship, Kiwi scores were: Paul Spiller 5, Bob Gibbons 4, Hilton Bennett 4 and Helen Milligan 3½. In the 2-day 28th ASTRO-IGB Merdeka Rapid Open Team Chess Championship, the Klang Valley Kiwis achieved the very creditable and prize-winning position of 10th. 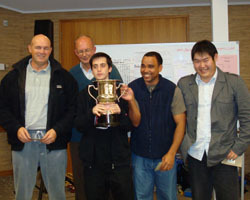 The team consisted of Brian Jones (Australia), Bob Gibbons, Paul Spiller, Hilton Bennett and Edwin Lam (Malaysia). August 17th 2008 - Second Sunday Puchen GM Rapid, Auckland. 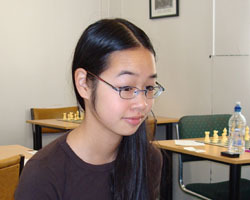 August 12th 2008 - Auckland Girls Chess Championship, Auckland. 2-3 Li, Jiapeng 5 Remuera Intermediate. Holden, Gina 4 Kowhai Intermediate. Tomlin, Chelsea 4 Rangeview Intermediate. 9-11 Soppet, Zoe 3.5 Kowhai Intermediate. Fuemana, Tamara 3.5 Rangeview Intermediate. 12-19 Foster, Tahina 3 Ferguson Intermediate. Morgan, Olivia 2.5 Ponsonby Intermediate. Ingram, Nicole 2 Ponsonby Intermediate. Patea, Harmony 1.5 Ferguson Intermediate. 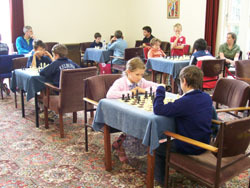 August 11th-12th 2008 - Christchurch Girls Chess Competitions, Christchurch. August 8th-10th 2008 - Waikato Open, Hamilton. July 23rd 2008 - Jenkins Trophy Match, North Shore. North Shore defeated the challenger, Howick-Pakuranga, by 11½-8½. North Shore had white on odd-numbered boards. 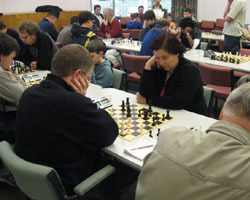 July 20th 2008 - North Island Rapidplay Championship, Tauranga. July 15th-19th 2008 - North Island Championship, Tauranga. 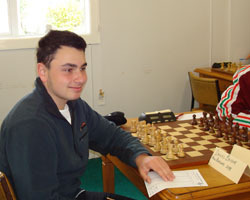 NZ Junior Rapid Champion: Mario Krstev with 5.5/6. Second equal with 5/6 were: Andy Chen, Daniel Shen, Judy Gao and Edwin Yip. 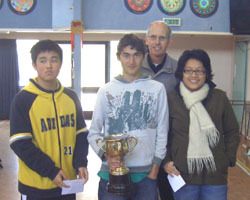 NZ Junior Champion: Andy Chen, Mario Krstev and Sue Maroroa, 6/7. Qualifiers carried forward their preliminary match results to the final, indicated by italics in the final tables (below). 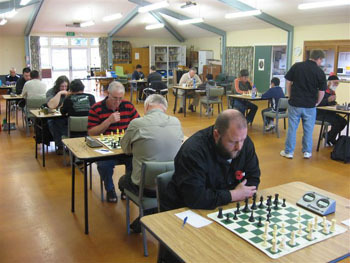 The Rapid Championship saw the third exciting cash between the Palmerston North (Davis) and Wanganui (Ker) Champions this year, with the Palmy champ winning in 19 moves with black in Round 4 to secure first and end Ker's tournament chances. 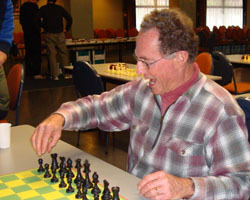 June 14th 2008 - Gordon Hoskyn Memorial Rapid 2008, Palmerston North. The organsers thank supporting sponsors Gambit Books, New Zealand Chess Supplies, Palmerston North Boys High Chess Club (for an excellent venue), and the New Zealand Correspondence Chess Association. A-Grade: 1st Russell Dive, 2nd= Scott Wastney and Michael Nyberg. B-Grade: 1st= Dave Capper, Mathew King, Chris Smith, Stephen Taylor, Megan du Plessis, Brent Cooze, Alan Aldridge. C-Grade: 1st= Brent Cooze and Megan du Plessis, 3rd= Neels du Plessis, Damon White, Andrew Brockway, Ryan Hill, Dylan Chen, Teh Gyu Kim, Daniel Yuan, Martin Stafford, John Young, Dennis Davey. Junior: 1st Megan du Plessis, 2nd= Ryan Hill, Dylan Chen, Teh Gyu Kim, Daniel Yuan. Thanks to DOP Martin Sims and Tournament Secretary Stewart Holdaway, and to Justin Davis for providing results and photographs. Download some of the games here (pgn file). Russell Dive watching Chris Burns and Dennis Davey. 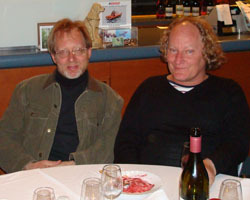 Martin Sims and Stewart Holdaway. 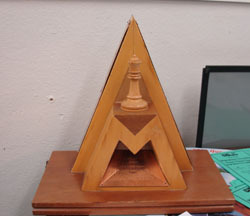 Many more photos can be found in Justin Davis' photo album of chess events. June 8th 2008 - Second Sunday Puchen GM Rapid, Auckland. Open: 1st equal Leonard McLaren, Bruce Wheeler and Mike Steadman. B-Grade: 1st equal Neil Cruden and Andrew Maroroa. May 31st-June 2nd 2008 - 31st Waitakere Licensing Trust Open, Auckland. A-Grade: 1st equal: Paul Garbett, Michael Steadman, Jeffrey McCrone, Peng Li Zhang and Gino Thornton. May 31st-June 2nd 2008 - Otago Queen's Birthday Open 2008, Dunedin. 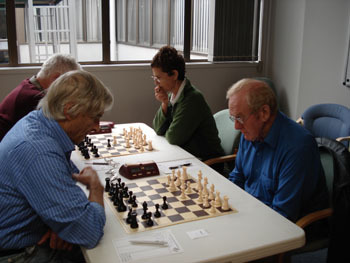 See report/games at the Otago Chess Club website. 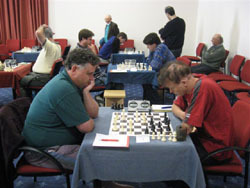 Palmerston North Club played host to an interesting 16 player, 6 round swiss at 10/10. With both the current Palmerston North Champion (Justin Davis) and current Wanganui Champion (Charles Ker) playing, the key encounter came in round 4 - Davis vs Ker. Davis quickly built a big advantage only to walk into a nasty tactic. With a point lead Ker looked to have the event in the bag, but a shocking last round defeat to a player rated around 800 points below him left a tie for first place. (thanks to Justin Davis for photo and results). 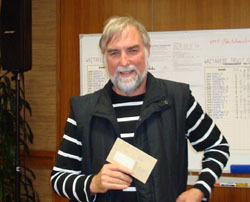 Won by Martin Post, John McDonald and Chris Burns (pictured; thanks to Justin Davis for photo and results). 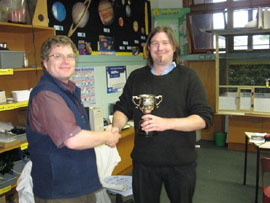 Won by Chris Smith (pictured; thanks to Justin Davis for photo and results). May 17th-18th 2008 - Westfield Pakuranga Junior Chess Tournament, Pakuranga, Auckland. 48 players played in the Preliminary - grouped by age - on Saturday 17th. 24 players played in the Final (Sunday 18th). 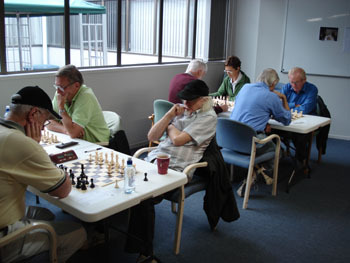 May 11th 2008 - Second Sunday Puchen GM Rapid, Auckland Chess Centre. Open: 1st equal Mike Steadman, Leonard McLaren, Antonio Krstev and Daniel Han. B-Grade: 1st equal Richard Taylor, Neil Cruden and Temu Maroroa. 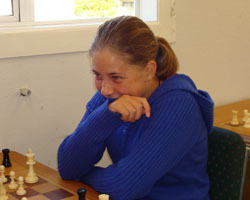 April 30th-May 4th 2008 - New Zealand Women's Chess Championship, Auckland. 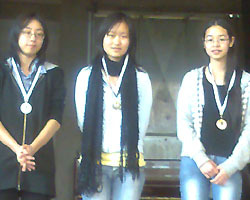 Joint Women's Champions 2008 are Natasha Fairley, Judy Gao, and Helen Milligan. Joint Women's Reserve Champions: Jiapeng Li and Joey Wong. Download the games from the Women's Championship here (pgn file). 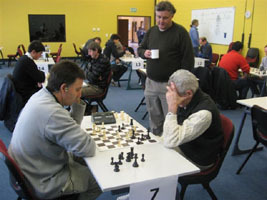 April 25th-27th 2008 - New Zealand Seniors Chess Championship 2008, Hamilton. 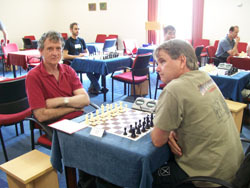 Joint Seniors' Champions 2008 are Peter Stuart and William Lynn. 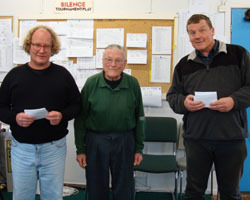 Joint under-1600 winners were Nigel Cooper, David Capper, and Tony Booth. Justin Davis writes - "After 20 years of successfully defending the Burnham Cup, Wanganui lost narrowly to a lower-rated Palmerston North team in 2007. Wanganui, keen to regain their Burnham Cup, made an impressive start with hometown advantage to this 2-part Interclub match, going into the lead in the first leg by 5 points, over 10 boards and 2 rounds. The second leg is due to be played in October." April 13th 2008 - Second Sunday Puchen GM Rapid, Hamilton. March 25th-29th 2008 - Sydney International Open, AUSTRALIA. 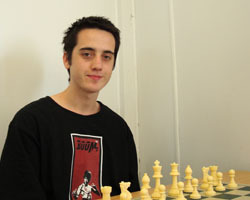 Website: http://www.chessaustralia.com.au/index.cfm?site=open for full results. 1st equal with 7/9: GM Surya Shekhar Ganguly (India), GM Zhang Zhong (Singapore), GM Gawain Jones (England), GM-elect Zong-Yuan Zhao (Australia). 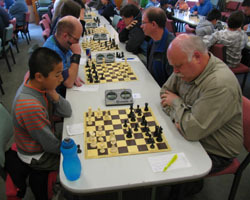 GM Murray Chandler 6, FM Bob Smith and IM Puchen Wang 5.5, Bill Forster 5, Helen Milligan, Mike Steadman, and Hilton Bennett 4.5, Bobby Cheng (also under-12 prize), John Sutherland, Fuatai Fuatai and Paul Spiller 4, Dan Dolejs 3.5, Ed Tanoi and Bob Mitchell 2.5. March 21st-23rd 2008 - Wellington Open. 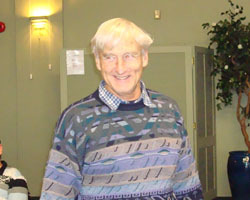 Director of play: Bruce Pollard. Special thanks to Alan Aldridge, Ross Jackson and Justin Davis for organisation and providing results/photos, and to Bruce for games and photos. Download games from the tournament here (pgn file). March 21st-23rd 2008 - MIT Easter Chess Tournaments, Auckland. 1st equal with 3.5/5: Leonard McLaren and Craig Blaxall. Top section: 1st Gino Thornton 3.5/5, 2nd Paul Godfrey 3.5. 1st Lawrence Leow 5/5, 2nd Henry Jiang 4/5. March 20th-24th 2008 - Doeberl Cup, AUSTRALIA. Website: www.doeberlcup.com.au for full results. 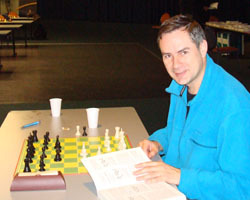 1st with 7.5/9 was GM VAruzhan Akobian (USA). IM Puchen Wang 6, Michael Steadman 4.5, Tony Dowden and Hilton Bennett 4. March 16th 2008 - 2008 Howick-Pakuranga Chess Club Annual Latvian Tournament, Pakuranga, Manukau City. March 9th 2008 - Second Sunday Puchen GM Rapid, Auckland. 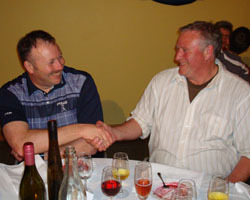 Justin Davis writes - "In 2005 Wanganui Club defeated an underpowered Wellington team. 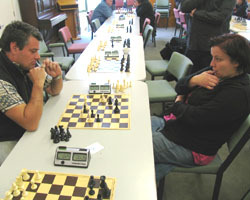 In 2006 Palmerston North narrowly defeated a higher rated Wanganui team. Since Palmerston North players had won the Wanganui Club Champs in 2006 and 2007, the idea came about for a combined team to crush Wellington. Sadly a couple of the stronger players were missing from the Wanganui/Palmerston North team, and Wellington remembering their previous defeat turned up with some of their strongest players. Wanganui/Palmerston claim that we will avenge this defeat in the rematch!" February 23rd 2008 - Bay of Plenty 25' + 5" Rapid, Tauranga, organised by Caleb Wright, Mt Maunganui RSA CC. January 15-25 2008 - New Zealand Chess Supplies 115th New Zealand Congress, Auckland. 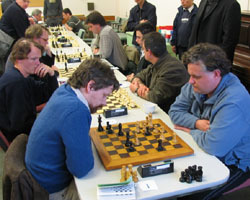 Some photographs from the event are available here (including the prize-giving for the 2007 Millennium Hotels NZ Chess Grand Prix). under-1800: 1st equal Craig Blaxall, Sue Maroroa and Natasha Fairley. under-1600: 1st Neil Cruden, 2nd Bruce Kay. under-1800: 1st Sue Maroroa, 2nd equal Edward Tanoi and Nigel Cooper. under-1500: 1st equal Edward Huang and Edwin Yip. 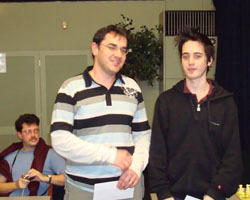 Reserve section: 1st Antonio Krstev 9/10; 2nd Sue Maroroa 8/10; 3rd Gino Thornton 7/10. Full results are available for download (Word document). 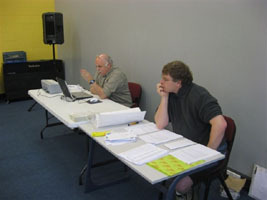 Open - 1 Bob Smith $600 2 Leonard McLaren $400 3 Michael Steadman $300 4 Paul Garbett $250 5 Nic Croad $200. Under 2000 - 1 Mario Krstev $350 2 Antonio Krstev $250 3 Fuatai Fuatai $250 4 Bobby Cheng (taking 2nd Junior prize) 5 Jeremy Browne $100. Under 1700 - 1 Filip Petreski $300 2 Viv Smith (taking Female prize) 3 Simon Ward $200 4 Eachen Chen (taking 2nd Female prize) 5 John Book $150. 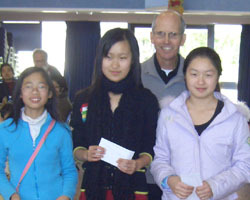 Under 1400 - 1 Gary Judkins $200 2 Harry Ruan (taking U14 & U1400 prize) 3 Jack Ruan $150 4 Sharon Wu $100. Junior - 1 Mario Krstev (taking U2000 prize) 2 Bobby Cheng $200 3 Sue Maroroa $150 4 Filip Petreski (taking U1700 prize) 5 Eachen Chen (taking 2nd Female prize) 6-7 Puchen Wang & Daniel Baider $50 each. Female - 1 Viv Smith $200 2 Eachen Chen $150 3 Sue Maroroa (taking 2nd Junior prize) 4 Nicole Tsoi (taking 2nd U14 & U1400 prize) 5 Helen Milligan $100. 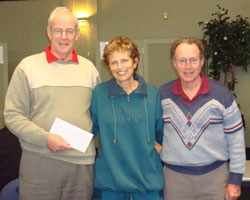 Senior - 1 William Lynn $200 2 Viv Smith (taking Female prize) 3 Neil Cruden $150 4 Ron Collingwood $100. 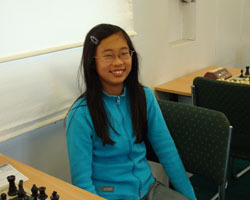 Under 14 & Under 1400 - 1 Harry Ruan $150 Nicole Tsoi $100 Alan Ansell $50.